Bars and Bells looks like a standard slot; with its five turning wheels and three rows, it thus sports a standard layout. 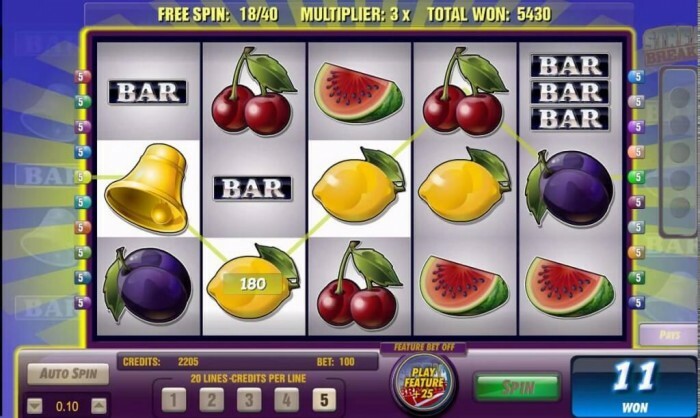 Many symbols on this slot will remind you of symbols of older fruit slots. The cherries, the watermelons, the lemons, and the always easily-recognizable BAR can all be found on its wheels. However, don't be fooled by its old-fashioned look. Namely, the animations on this slot are clearly custom designed for it and fit very well. The bell symbol makes a bell sound and also functions as the wild symbol, and can replace any other symbol, but the scatter. This last part actually is standard. Bars and Bells might look somewhat plain and simple, but it has very interesting features. The slot has many fruit symbols, the layout of the machine is standard, and the sound effects also fit perfectly well with a traditional slot. 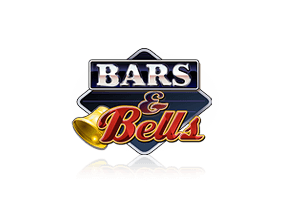 However, Bars and Bells is actually not what you would expect from a standard online slot. Namely, this slot actually pays you after not winning anything five times in a row. Additionally, this slot has a random feature, you can win very many free spins, which also has a multiplier. And also, it even has a wild symbol that makes a sound when it pops up on one of your wheels. How does one play Bars and Bells? Bars and Bells looks like a standard slot; with its five turning wheels and three rows, it thus sports a standard layout. 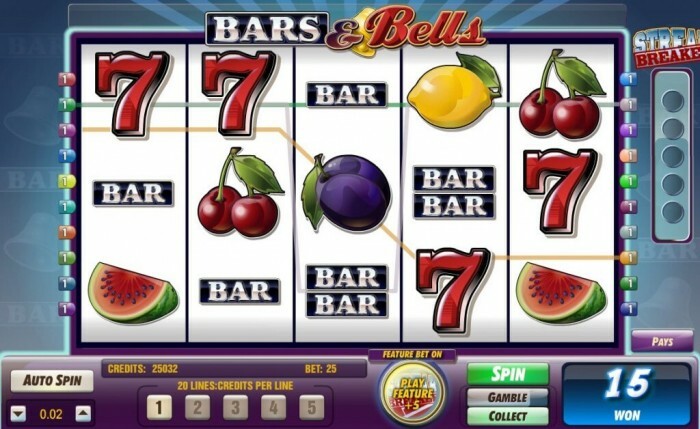 Many symbols on this slot will remind you of symbols of older fruit slots. The cherries, the watermelons, the lemons, and the always easily-recognizable BAR can all be found on its wheels. However, don’t be fooled by its old-fashioned look. Namely, the animations on this slot are clearly custom designed for it and fit very well. The bell symbol makes a bell sound and also functions as the wild symbol, and can replace any other symbol, but the scatter. This last part actually is standard. When you are playing Bars and Bells and you do not win anything for five consecutive spins, the machine will actually pay you some money. Namely, after every unsuccessful spin, the machine stacks a coin on the right-hand side of the machine. After you have acquired five of these coins, they will be exchanged for a disbursement. Even though this idea is actually great, it does not happen often that one loses five times in a row. And luckily so. What will happen more likely, is you winning free spins. For this, you need to get the scatter symbol at least three times. When winning free spins you get 5, 7, 10, 15, or even 20 free spins. Additionally, you will receive a multiplier of two. This multiplier means that all your winnings during free spins will be doubled. Because you can win even more free spins while playing with spins, there is a lot to be won. This awesome also has another feature, which is completely random. This means, you do not need any specific combination on any pay lines; it just happens when the machine feels like it. If you are granted this bonus, the machine will start shaking and animations will start falling down. Each of these animations has some monetary value, and it’s all for you. At the minimum, this bonus will yield you 20 credits, but it can be way, way more. Namely, you might just end up with an additional 5,000 credits! Especially when you have configured your credits to a high value, this is a wonderful bonus! Bars and Bells makes use of 20 pay lines which you cannot alter. You can, on the other hand, alter the value of your credits, and also how many credits you wager per spin. At the bottom of the screen, you can turn on the feature function. When turning this function on, you wager a bit more credits, and, in turn, the machine pays when you lose. You can also turn it off. The machine also has an autospin function, and you can configure the number of spins after which it turns itself off.